I first heard of “no knead bread” thanks to the famous NY Times post and bookmarked it for a later attempt. I forgot about it until I saw the Cook’s Illustrated Video (via their free podcast). The video seemed so simple and I knew I could trust these guys to deliver a solid, tasty recipe. So I set about trying it out in my new Le Creuset French Dutch Oven. The results were better than I could have hoped for and tastier than breads I’ve been served at some restaurants lately. Most should know Cook’s Illustrated but if you don’t it’s a very simple cooking magazine. They have a lovely graphical, illustrated style that’s clean and to the point. There are no advertisements so you know you can trust their product reviews. They also take classic recipes and dissect them via the America’s Test Kitchen arm of their operation and come out with the “best” version of that recipe. Sometimes it’ll be making a dish healthier (like Spanish style Tortilla not cooked in 4 quarts of oil) or elevating a classic recipe (browning the butter in the famous Tollhouse chocolate chip cookie recipe). For this recipe they found that adding beer to the recipe will simulate the flavors of a more complicated, developed yeast starter. Also cooking the bread in a dutch oven helps give the crust a bit of crunch. Simple tweaks to the recipe, but one’s that make all the difference. On the video they recommend light, American style pilsners (which is a good use for them really since they’re not that great for drinking). I started first with a Budweiser and was impressed with the flavor in the bread. But since I’m in Asia I’m now on a mission to discover which Asian beer will work best for the bread. So far I’ve tried San Miguel Light and Tiger. Dare I try Chang? If you have a stove and about 5 bucks spending money in your pocket you owe it to yourself to try this recipe. It’s simple, doesn’t take much actual working time (though does take some planning time for the cooking and prep but that’s just leaving it overnight), and very tasty. Watch the Video for visual instructions beyond the recipe and enjoy! Got any tweaks to the recipe you’ve found? Let us know in the comments. If you want more no-knead bread recipes, Jim Lahey is considered the expert and has published a book that has become the baking bible for many, My Bread: The Revolutionary No-Work, No-Knead Method . I’m the author of Kneadlessly Simple, which contains some similar, but even easier bread recipes than the one you have here. If you’re interested in trying my method, I have posted a couple recipes on my website kitchenlane.com. There is a third one, a crusty boule recipe similar to the one here, on the npr.org website–you need to search on no-knead bread for it. Not only is the method the easiest, most foolproof and fuss-free one around–but due to the use of ice cold water it produces fabulous tasting bread. Happy Baking! Thanks for the tips. Will look into these and give them a try. I’m going to try baking bread this weekend! Which beer shall I use? 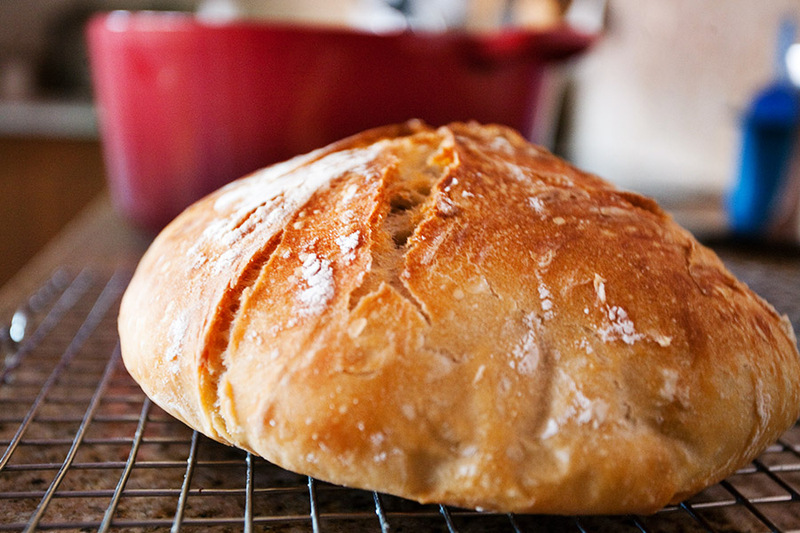 Have you tried the NYT original version of the Almost No-Knead bread? I have to say, watching the 2 videos on here: http://www.breadtopia.com/cooks-illustrated-almost-no-knead/ is a bit more helpful than watching the Cook’s illustrated video.